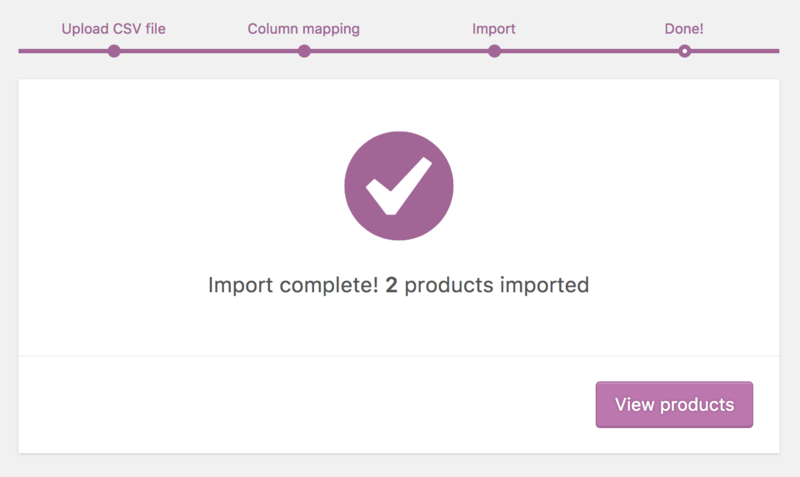 WooCommerce has a built-in product CSV importer and exporter, as of version 3.1x. 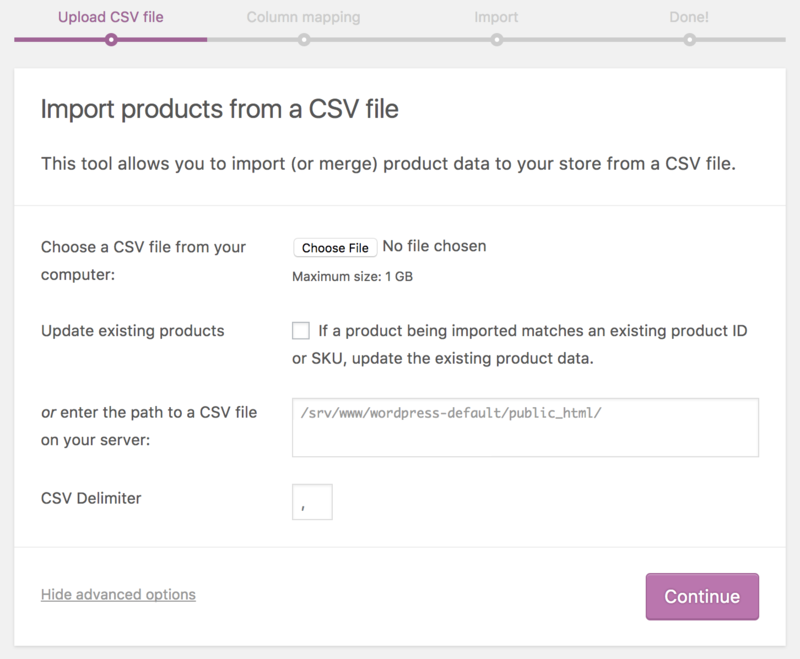 Import, export or update hundreds or thousands of products in your WooCommerce store with a single CSV. This tool supports all product types, including variations. Export a CSV of products from an existing store. 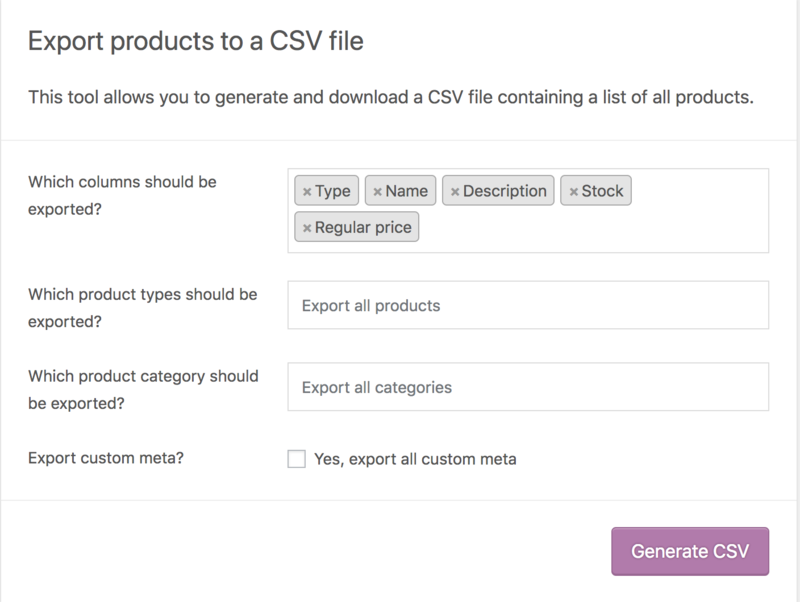 Create a CSV of products using this blank and formatted CSV file. Download a CSV file with sample data from GitHub and replace it. Use your own CSV. Any information you wish to include should follow the formatting and columns of the Product CSV Import Schema. 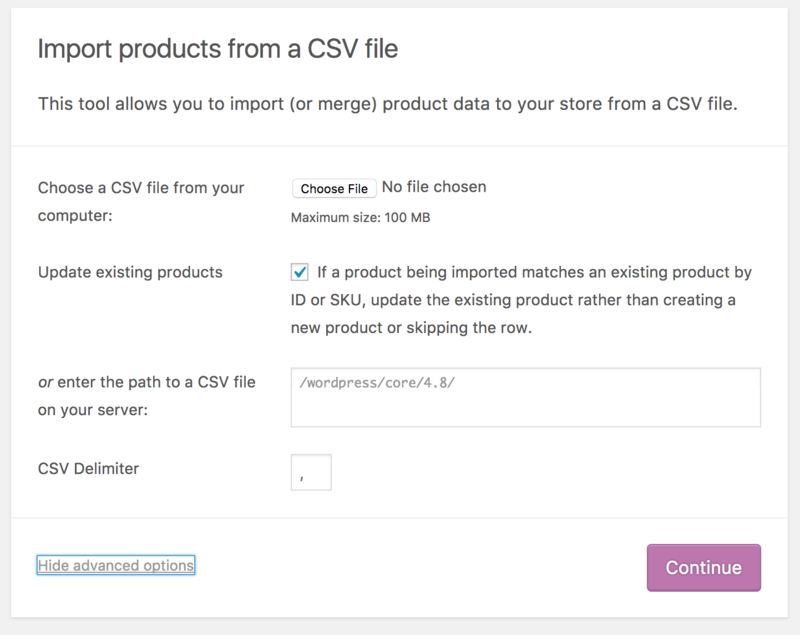 If using the built-in WooCommerce tool to export a CSV, it already follows the schema and is ready to use. 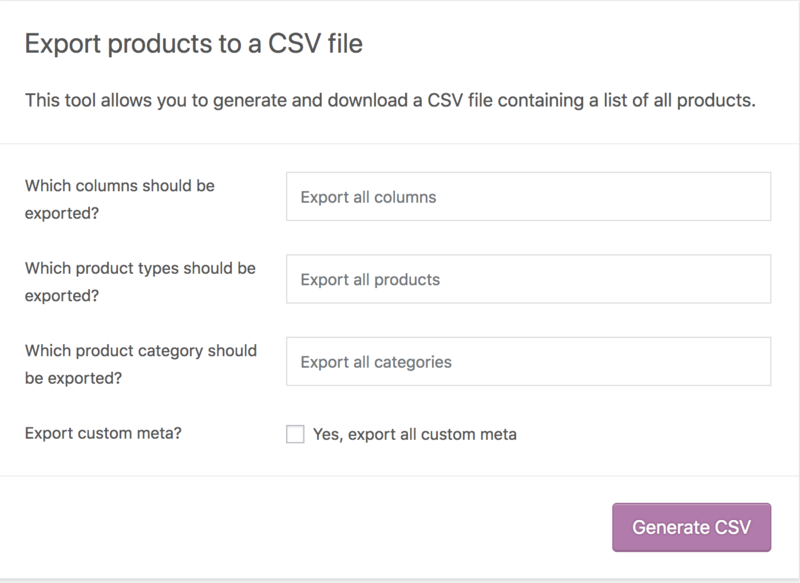 If using the blank and formatted CSV file, it also follows the schema; just be sure to enter the info as instructed at Product CSV Import Schema. CSVs should be in UTF-8 format. Dates should be defined for the store’s local timezone. Multiple values in a field get separated with commas. Wrapping values in quotes allows you to insert a comma. Custom meta is supported/imported but only plain text – no support for JSON or Serialized data. Taxonomy term hierarchy is denoted with >, terms are separated with commas. Draft products are not exported, only published and privately published products. Images need to be pre-uploaded or available online to import to your store. External URLs are supported and imported into the Media Library if used. You can define the filename if the image already exists in the Media Library. 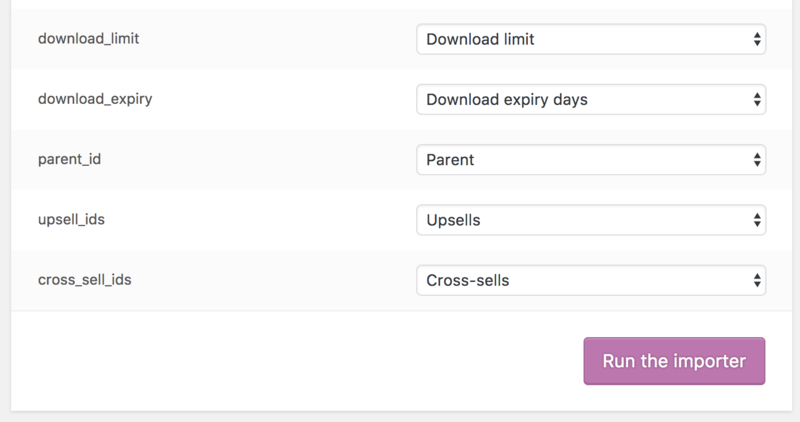 First-time and existing store owners using WooCommerce can use the CSV to add new products with one upload. 1/ Go to: WooCommerce > Products. 2/ Select Import at the top. The Upload CSV File screen displays. 3/ Select Choose File and the CSV you wish you use. CSV delimiter (Advanced option): Generally CSV elements are separated by a comma. If you are using a different delimiter in your file, you can set it here. 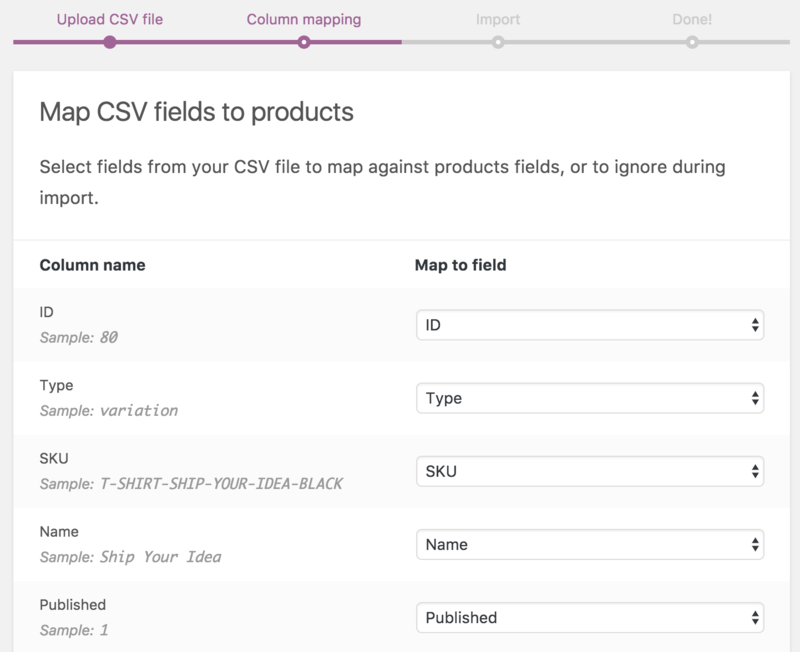 The Column Mapping screen displays, and WooCommerce automatically attempts to match or “map” the Column Name from your CSV to Fields. *Any unrecognized columns will not be imported by default. 6/ Select Run the Importer. 7/ Wait until the Importer is finished. Do not refresh or touch the browser while in progress. Store owners can use the CSV Importer tool to update existing products with new info, e.g., Adding a brand, changing a tax class, bulk-update for a special sale or event, etc. 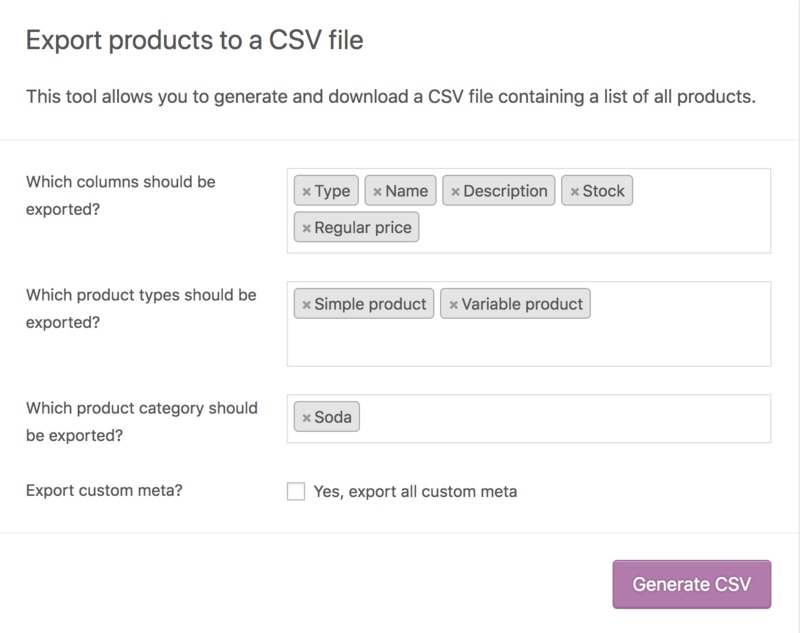 1/ Make a CSV file as indicated in Create Your CSV, using the IDs and/or SKUs of products you wish to update. The importer uses the ID and/or SKU to auto-match and auto-update whatever info you enter on each line. 2/ Go to: WooCommerce > Products. 3/ Select Import at the top. 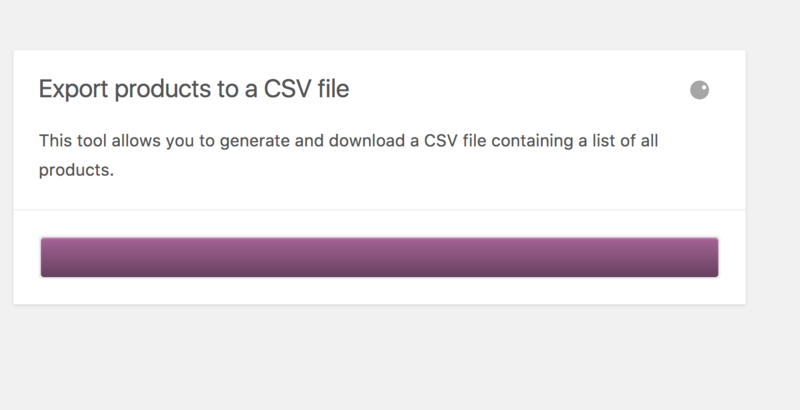 The Upload CSV File screen displays. 4/ Select Choose File and the CSV you wish you use. 5/ Tick the checkbox for Update Existing Products. 8/ Select Run the Importer. 9/ Wait until the Importer is finished. Do not refresh or touch the browser while in progress. 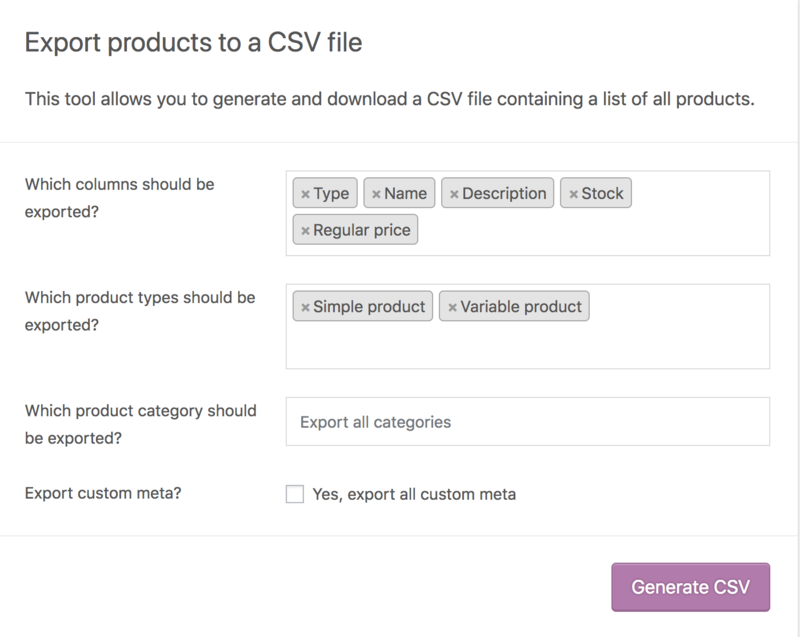 Store owners wishing to export their current catalog of products for any reason can generate a CSV using the Product Importer/Exporter. 2/ Select Export at the top. The Export Products screen displays. 3/ Select to Export All Columns. Or select which columns to export by using the dropdown menu. 4/ Select to Export All Products. Or select which product types to export by using the dropdown menu. 5/Select to Export All Categories. Or select which categories to export by using the dropdown menu. 6/ Tick the box to Export Custom Meta, if you need this info. Meta data on your products is typically from other plugins. Meta data columns are exported following the meta:-prefix standard detailed above in the importer mapping section. By default, no additional meta data is exported. 7/ Select Generate CSV. Wait for the export to finish. Address: Lot A25, Quang Thang Ward, Thanh Hoa City, Thanh Hoa Province, Viet Nam. Openning (Mon - Fri): 8h00 - 11h30 and 14h00 - 16h30. Online support 24/7.